This Christian movie is made by PureFlix Entertainment, the same company that made the God’s Not Dead movies, The Case for Christ and many other Christian movies that are well-known all over and quite impactful as well. It’s a family-friendly movie mixed in with some action as well. 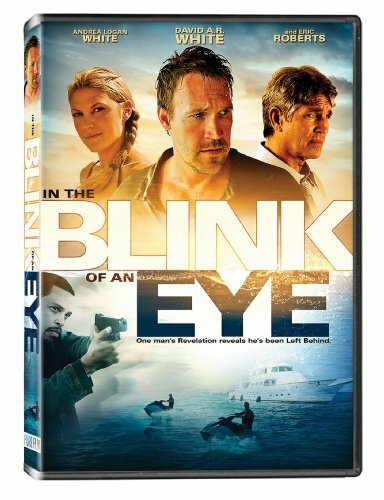 In the Blink of an Eye tells the story of how a group of detectives from the police force save a famous singer from harm therefore by saying thanks, they are invited to spend a weekend in Mexico on a yacht. Soon the vacation turns to the worse as many people go missing. At the beginning of the Christian movie In the Blink of an Eye, we meet David and Larry, two detectives from the police force. They are assigned a new case of a famous pop star who has been declared missing and they have to find her whereabouts and bring her back to a safe place. It seems easy saying it but the task is quite difficult and especially dangerous. They find some leads and head to a trailer park that is actually abandoned. While looking for the singer, the detectives encounter the kidnappers. A confrontation begins with both parties and suddenly a shot is fired and David is hit. The shot was headed to David’s heart but his cellphone was in the place where the bullet hit, therefore, it saved his life. In this moment he takes the opportunity to eliminate the kidnapper and analyze the scene. It all seems finalized to Larry and David and they are looking forward to some relaxing time. Kevin, the singer’s manager, arrives and plans to take her away. Larry and David quickly think the man has something to do with the kidnapping and is connected somehow with that world but in order to investigate him furthermore, David and Larry manage to get invited to the yacht trip, the manager is planning. David and Larry from In the Blink of an Eye inform their respective wives about the relaxing trip but leaving out the details of the dangers this trip could have. They really aren’t sure if Kevin is actually connected to the kidnapping so they intend not to worry their significant others about something they’re not sure of. They all embark on the trip and everything seems to be going well and Larry and David begin to think that they’ve wrongly judged Kevin. But later on in this Christian DVD, David’s boss calls him and informs him that they’ve found a picture of the kidnapper with Kevin. This makes David’s strong suspicion about Kevin come reeling back. After his call, David finds his wife Lori quite mad with him since he’s been with something in his mind the entire trip. But of course, she doesn’t know what is really going on so this causes some sort of strain in their relationship. Soon in the Christian movie In the Blink of an Eye David decides to confront Kevin about the picture. Of course, Kevin denies being in the picture and says that he wasn’t involved in the kidnapping. Now, Lori, David’s wife has been learning from Sue, Larry’s wife, about Christ and has considered the Lord as her Savior. Lori has changed and David has noticed and even though she wants to talk to him about her newfound faith, David is always focused on his work and doesn’t really want to listen about her experience with God. David really doesn’t attribute his wife’s change to God. At one point when David falls asleep and wakes up again, he notices that his wife, Larry, and Sue have disappeared. He is now alone on the yacht with the crew and Kevin. Now David has to solve this mystery on his own and also has to look for his wife and friends. He continues finding some clues that link Kevin to the crimes that have been occurring but David realizes that he can’t tackle this on his own. That night he falls asleep and when he wakes up the next day, his previous day is playing out again. This happens for several days as David wakes up and the same day keeps playing out again. He does everything he can to change the day but to no avail. But he soon discovers that the rapture has occurred and Lori, Larry, and Sue have gone to heaven. God is repeating the same day to give David a chance to repent, form a relationship with Him and become saved. You can find this impactful Christian DVD at the Fishflix store!